"One of the most luxurious heritage style hotels in Jaipur, Hotel Vimal Heritage offers a traditional royal setting clubbed with world-class facilities and impeccable hospitality services. The hotel has a structure inspired from Rajasthani colonial style of architecture, featuring carved balconies and oriental stone pillars. 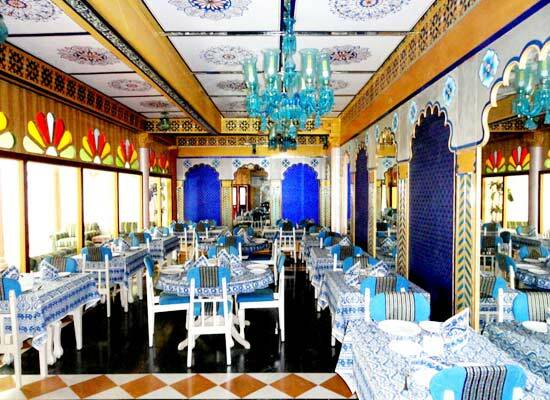 This heritage-style hotel has Rajasthani murals and frescoes in bright colors, mirror work and colorful glass on ceilings and walls. The guest rooms too have a wonderful decor and come with contemporary conveniences. 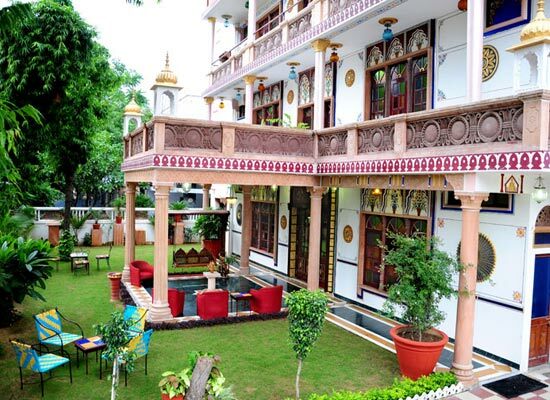 The hotel is set amid a well-maintained lush garden. Spa, gym, swimming pool and a multi-cuisine blue-themed dining venue- Neel Mahal are some of the modern facilities. 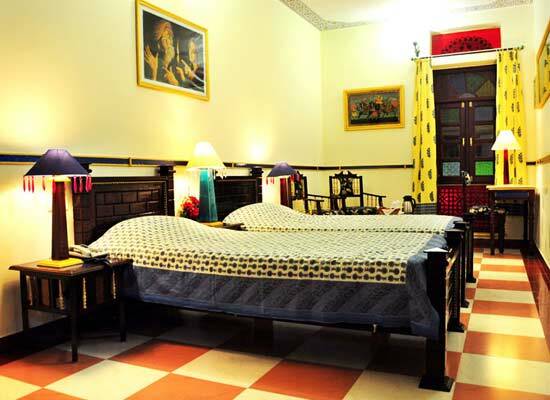 Hotel Vimal Heritage, Jaipur has 20 spacious rooms with elegant interiors, richly furnished, featuring Imperial wooden furniture, special Jaipur block print bed sheets with matching curtains, wooden flooring and walls with mirror work well as Rajasthani paintings. Along with air-conditioners, all the guest rooms come with all the modern comforts so that the guests can have a memorable stay while enjoying Rajputana hospitality. Multi-colored glass adorn the huge windows, adding a charm to the rooms. The guest rooms are airy and offer views of either the garden or the swimming pool or both. The attached bathrooms are clean and huge. They feature designer towel racks, plush toiletries, granite counters, stylish fittings, full-sized mirrors and glass partition for shower areas. The dining experience here is a memorable one. The Peacock Darbar Hall- Neel Mahal is amulti-cuisine dining hall, where the guests can savor multi-cuisine vegetarian as well as non-vegetarian dishes. 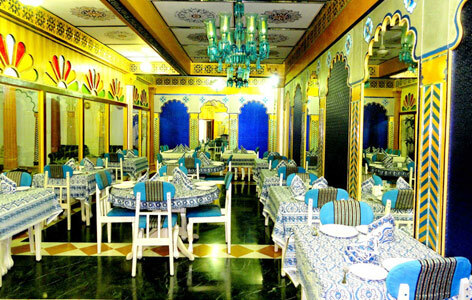 Indian, Rajasthani and Continental delicacies are served in buffet as well as in à la carte form. Do not miss out on sumptuous local desserts. The meals are prepared meticulously by the chef and his team by using freshest of ingredients and aromatic spices. Candle-lit dinner can also be arranged at the rooftop chattris. Just relax by the pool and enjoy your favorite drink. Fondly known as the ‘Pink City’, Jaipur is the capital city of the royal state of Rajasthan. Popular amid national as well as international tourists, it is dotted with several attractions such as Amer Fot, Jantar Mantar, City Palace, Hawa Mahal and so on. Shopping for handicrafts, semi-precious stones etc. at the colorful local bazaars of Jaipur is a must.